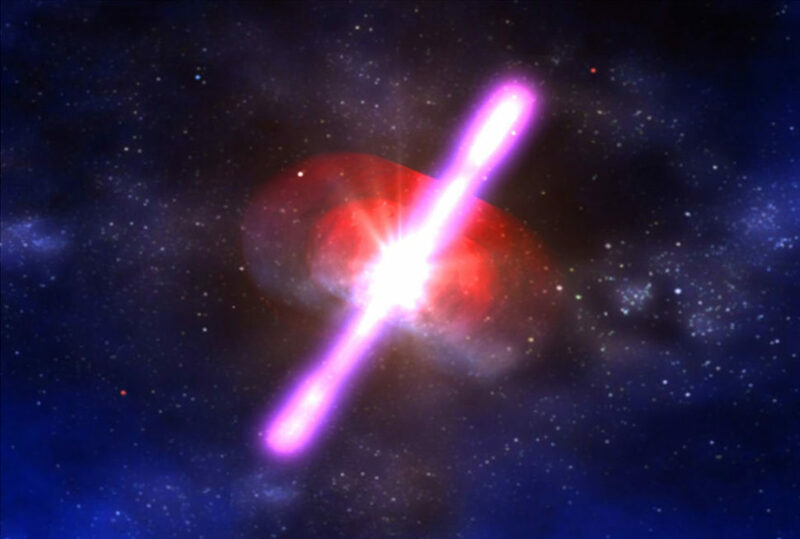 Scientists have, for the very first time, been able to detect the effects of a gamma-ray burst without seeing the cause of the burst itself. For the first time, scientists were able to detect evidence of a gamma-ray burst from an unseen cosmic explosion millions of lightyears away from our planet. Years of hunting the sky for a phenomenon known as an “orphan afterglow” has finally paid off for a team of researchers after the discovery of one. The afterglow was reportedly caused by a powerful gamma-ray burst from a star that had just collapsed. The scientists believe that the massive star from a galaxy 300 million lightyears away from Earth collapsed into either a magnetar or black hole. During the process, the star reportedly produced two jets of gamma rays which traveled outward in two opposite directions from it. Land-based instruments detect most gamma rays when they are pointed in our planet’s direction. This particular collapsing star has its GRBs pointed away from Earth which made them completely untraceable. However, the jets from the gamma-ray burst reportedly crashed into the gas surrounding the collapsing star. This resulted in a so-called sonic boom which in turn produced an afterglow that radiated radio energy in different directions. “This is the first time anyone has been able to capture the sonic boom from an unseen GRB explosion,” Bryan Gaensler, the Director of the Dunlap Institute for Astronomy & Astrophysics from the University of Toronto and one of the co-authors of the study, said. Gaensler and his colleagues compared the data from the Very Large Array Sky Survey (VLASS) gathered by the Karl G. Jansky Very Large Array in New Mexico with the previous data surveys of the sky. They found that one radio source from the old maps of the sky is no longer visible in VLASS. “Looking at the radio source in other old data shows that it lived in a relatively nearby galaxy, and back in the 1990s, it was as luminous as the biggest explosions known, gamma-ray bursts,” Casey Law, lead author of the study from the University of California-Berkeley, said. Apparently, the brightness of the source and its evolution over the decades were indicators that it came from a GRB. In addition to that, it was also found in an area of the universe where the astronomers expect GRBs to be seen. This recent discovery provides scientists new insight into the nature of GRBs and their jets. It also promises a far more accurate GRB survey today and in the future with the help of sophisticated astronomical radio surveys used to scan the sky. Do you believe that scientists will be able to build more sophisticated instruments capable of detecting harmful gamma-ray bursts before they reach our planet?